Back in January I got an email from one of the PR reps at CD Projekt RED about a potential replica to showcase a new game from a familiar franchise. For those more into the tabletop RPG scene, the name Cyberpunk is probably an old favorite, and the guys at CD Projekt RED will be bringing this universe to the video game world with their upcoming title Cyberpunk 2077. 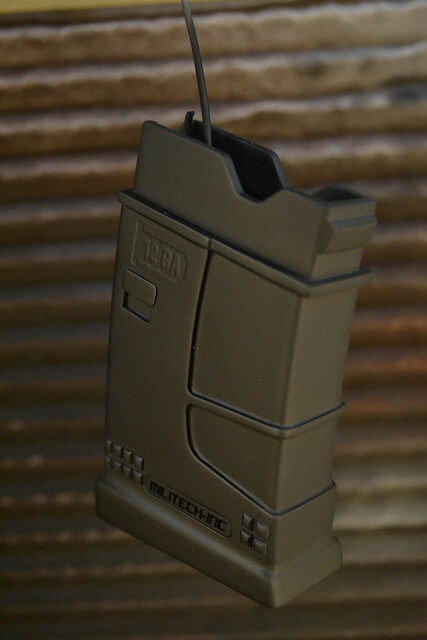 The replica they were after is a new take on a staple of the series, the Militech Crusher. This new version fired 12ga slugs and is a sort of SMG layout with a short body and forward grip. It's a deceptively complex design that was challenging and very fun to build. I got a lot of references from the studio, and started out by drafting some 2D blueprints. 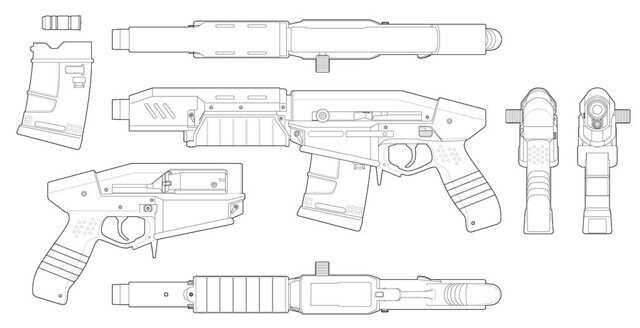 There are a lot of individual pieces to this gun, so I'll talk about their construction separately. 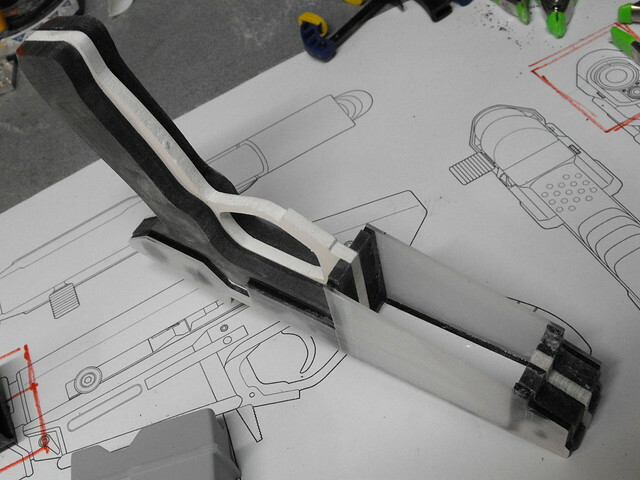 Many of the parts were trimmed on my laser cutter to create the inner framework for things like the magazine and barrel shroud. 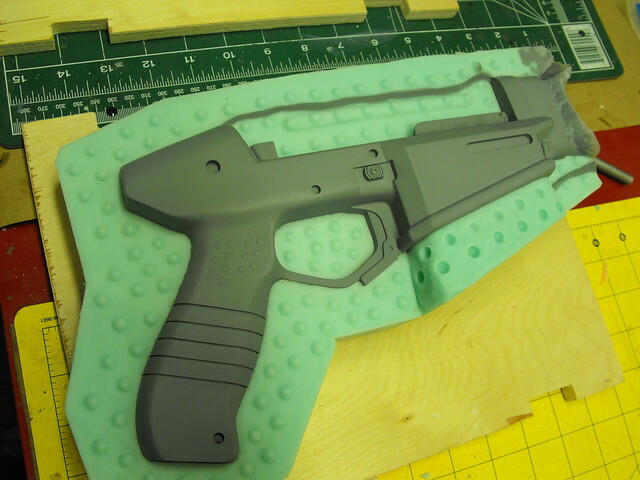 Laser cut acrylic was used for 90% of the gun magazine. The curved forward and back sections were made by bending styrene into place along the curve of the acrylic and gluing it into place. A ribbed detail on the bottom of the magazine was made by using textured styrene. 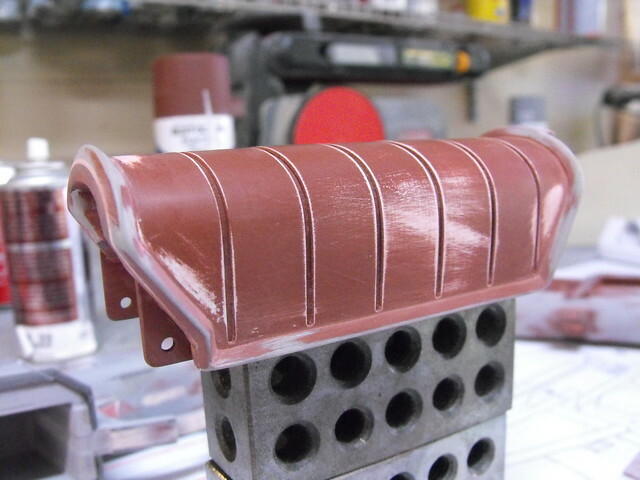 You can get this stuff at many hobby stores and it's typically used to make model housing for railroad scenes. 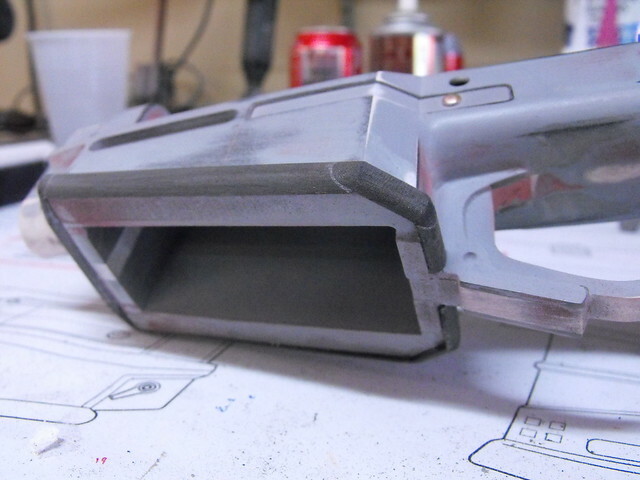 Here's the magazine after a few coats of primer and a little spot putty to fill in the gaps. 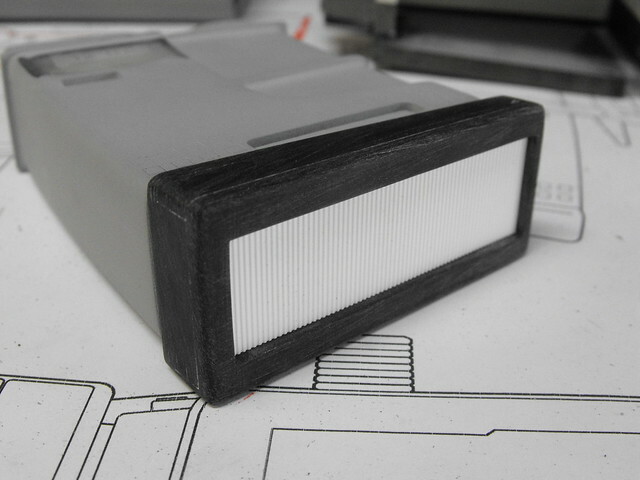 The small squares at the base of the part are plastic stick-on shapes used for scrapbooking. 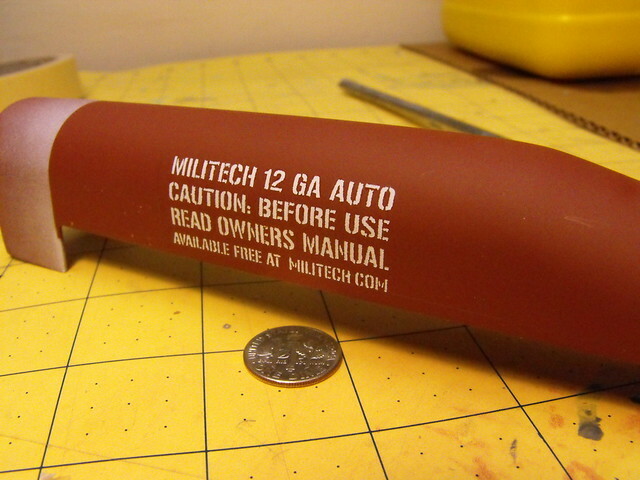 These types of things come in handy a lot more often than you'd think! Onto the barrel shroud - this needed to have a curved upper section, so 1" PVC pipe was cut and sanded to shape and glued in place. 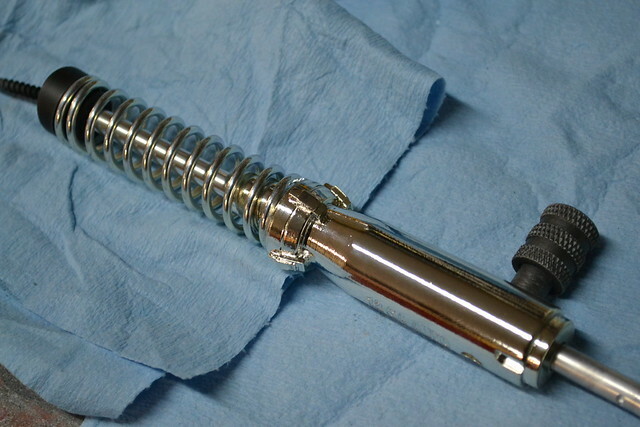 I repeated a similar technique in making the vacuum-form buck that would eventually be used to make the rear bolt shroud. 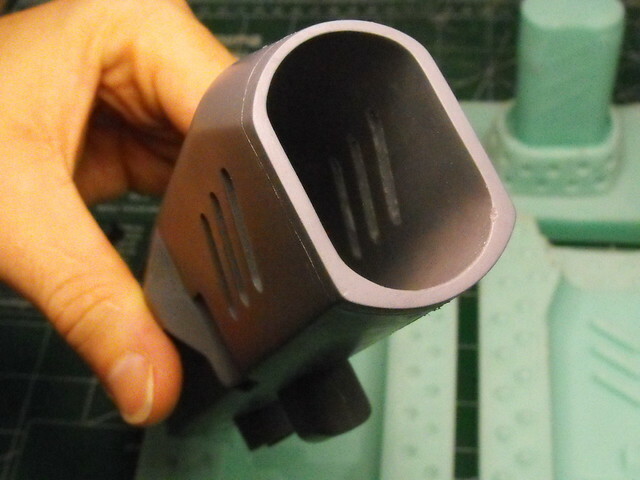 The rear angled face of this part was made with apoxie sculpt blended into the small step on the side of the shroud. There was a lot of sanding done to make this look like a smooth transition but (unfortunately) with the deadline and turnaround being pretty quick, sometimes my photography of the process suffered a bit. 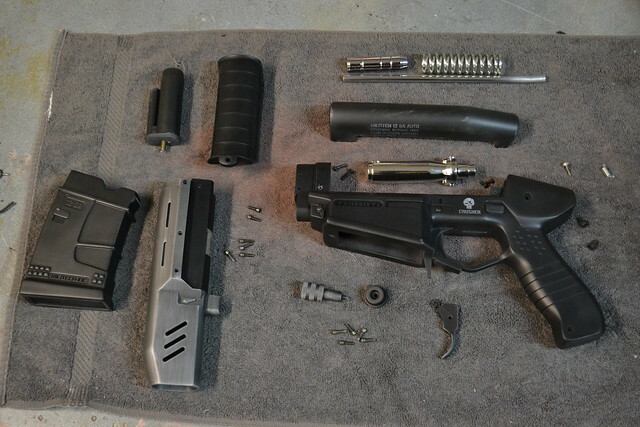 Mounting the barrel shroud to the main body of the gun was something I thought about for a while - this needed to be a very stable intersection as it would hold up the entire front part of the prop. 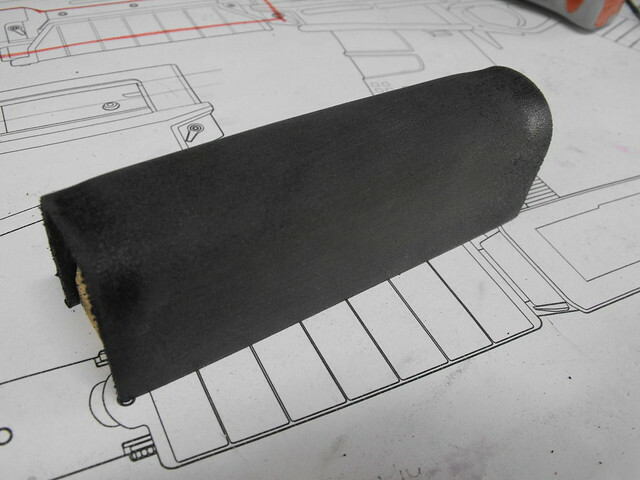 The back section of the barrel shroud had an oval-shaped cavity built into it which would eventually fit onto a matching plug created on the front edge of the gun body. I discovered new and terrifying angles with my mill when I cut out the oval slots on this part. Nerve-wracking, but it turned out very clean! Thicker pieces that I couldn't trim on my laser were hand cut on my scroll saw. 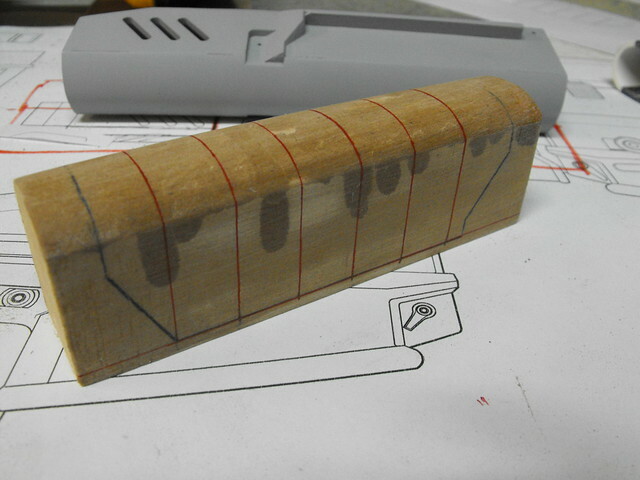 These three layers make up the bulk of the main body of the gun and are 6mm sintra. I used a white center spine to more easily determine the symmetry of the part. 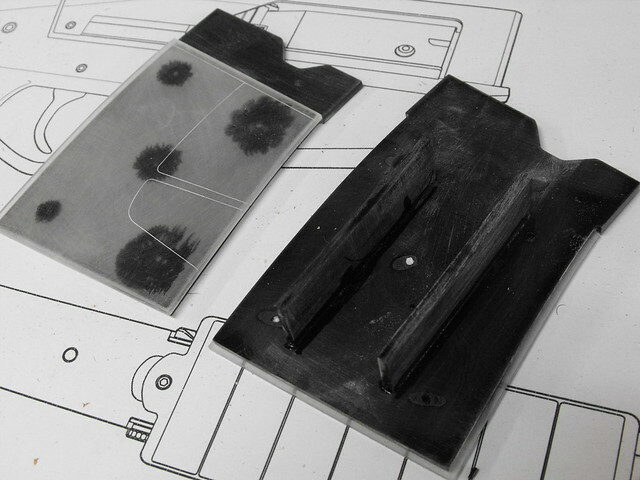 The main body needed to be able to house a removable magazine, so a square cavity was left in the lower portion during assembly. The side walls here are made up of .060" acrylic. An in-progress shot of a lot of components in their earlier stages. 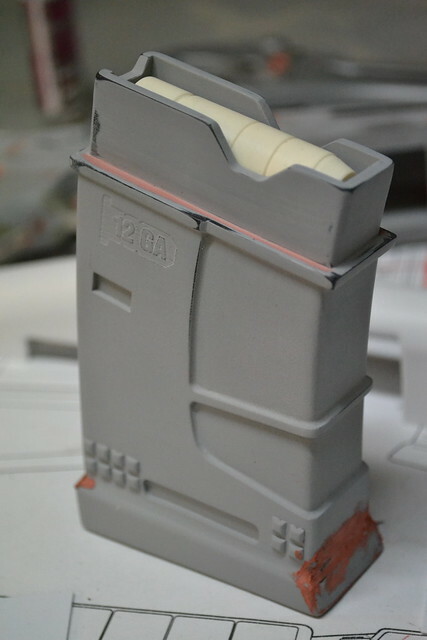 You can see here how the areas around the magazine well were built up in thickness by using 8mm sintra and styrene for the angled bevels. 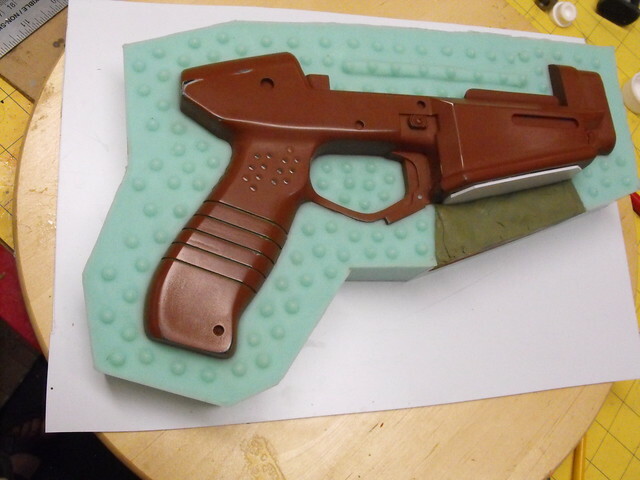 Contoured areas around the grip and trigger were added with apoxie sculpt and sanded down to a smooth curve. 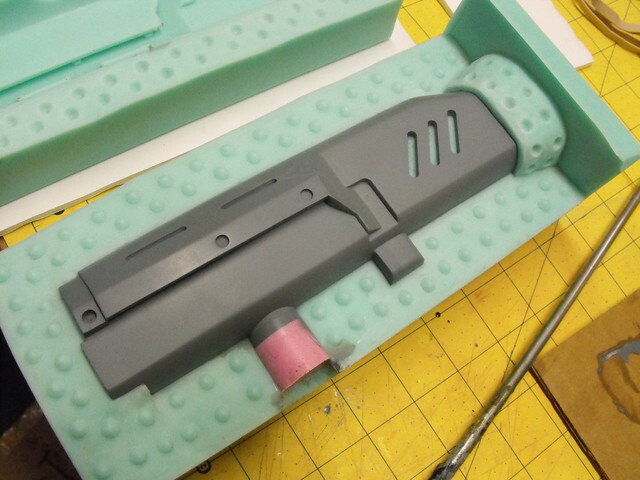 The upper portion of the gun was smoothed out with a piece of .020" styrene. 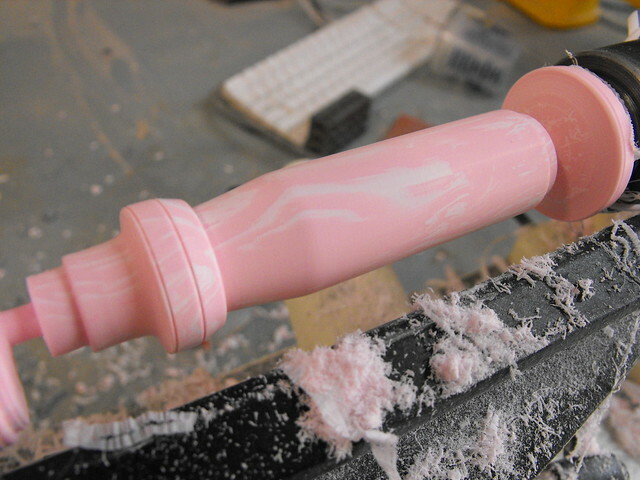 This was much easier than trying to sand all the individual layers perfectly flat. 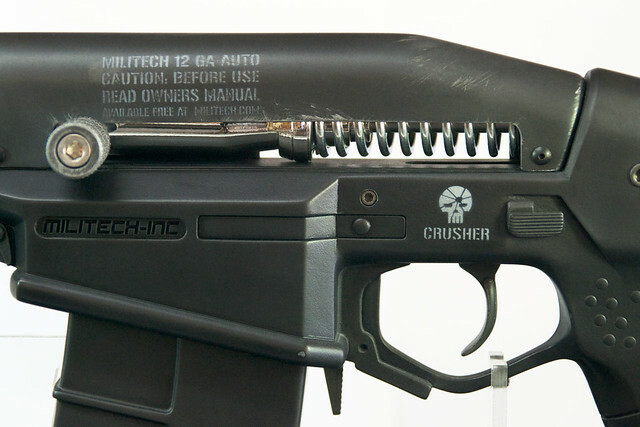 The two black tabs at the back are mounting points for the bolt shroud. 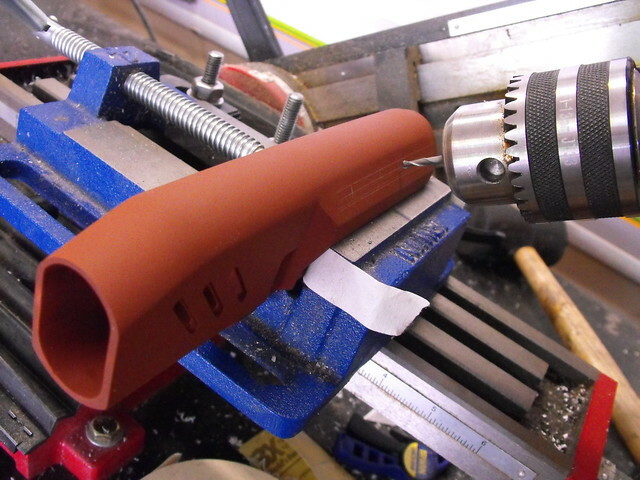 Recessed parts of the receiver, such as the logo indentation and magazine catch, were slotted on my mill. 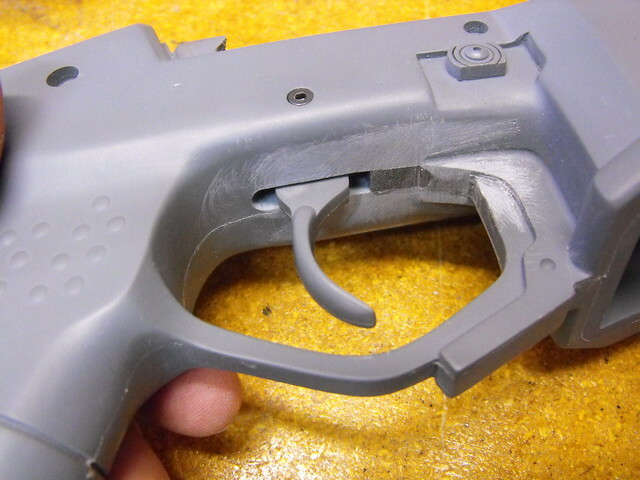 The mag catch was made with thin styrene. 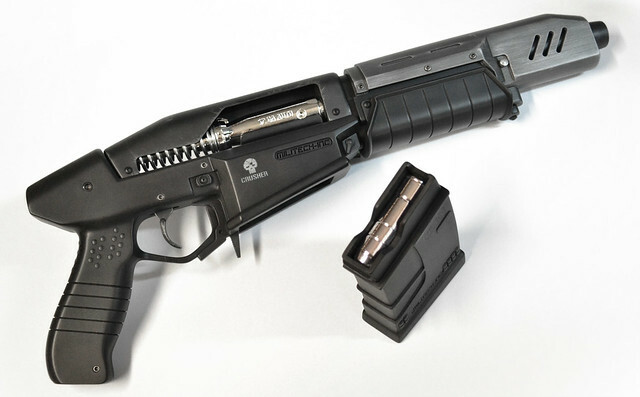 A rounded accent encompasses the perimeter of the mag well. I couldn't get half round stock in that thickness (and the part itself has a slight upward angle to it making it not *exactly* half rounded material) so I cut sintra strips out and sanded them to shape before gluing them in place. 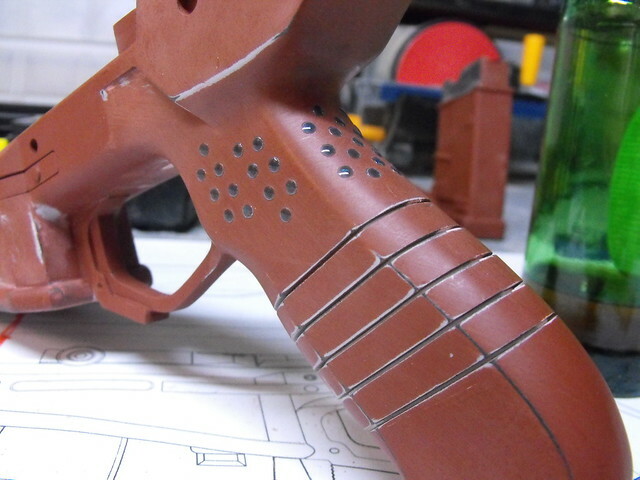 A bunch of holes were milled into the gun body for recessed screws. The grip was something a bit trickier to tackle. 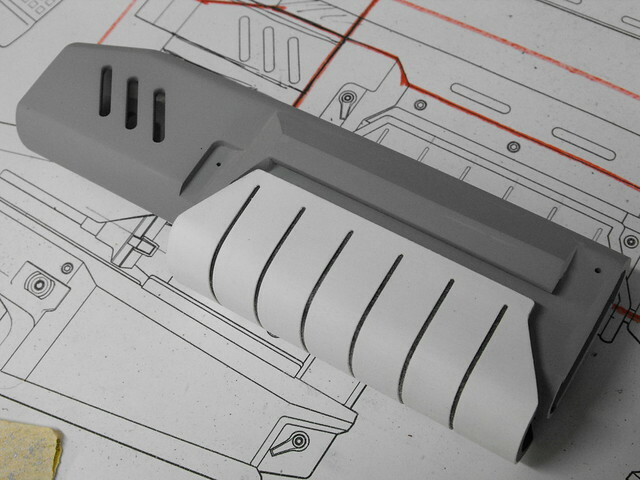 In the concept art, the grip has five shallow recessed lines which go around the entire perimeter of the handle. 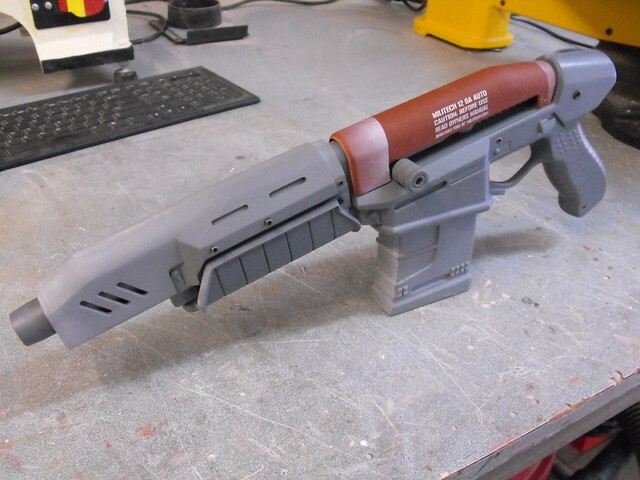 I decided the best way to get this look accurate would be to chop the grip into 6 sections and glue them back together with thin spacers placed in between them. 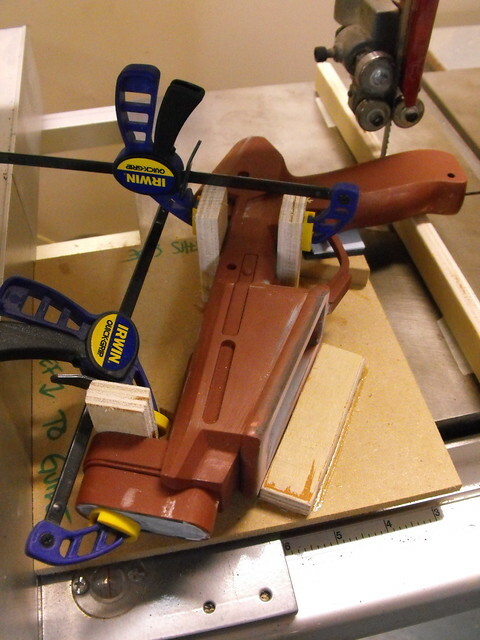 I started by making a jig which would hold the gun steady against the fence of my bandsaw so I could make each cut at an identical angle. By moving the fence in equal intervals while cutting the handle, I ended up with 6 parts and 4 inserts of identical thickness. 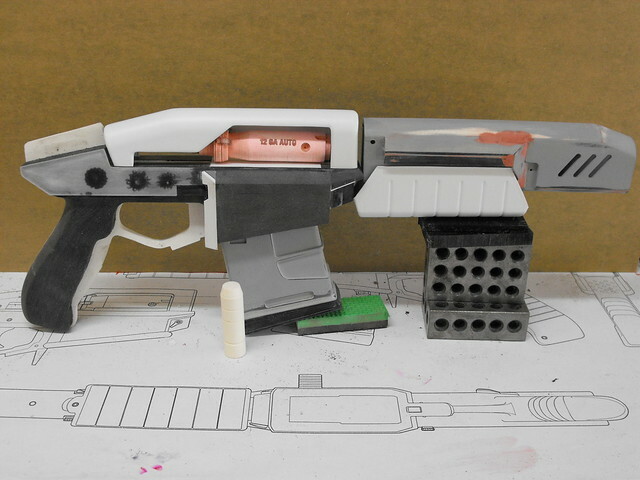 I affixed a piece of .040" styrene to the top of each piece before gluing them all back together. Also in this shot are more scrapbooking accessories - these little blue dots were in a packet of "raindrop" stickers. The forward grip was a bit of a tricky piece to get right. I actually made this part twice, since my first attempt was about .25" too narrow. I started out with a wooden buck and heated a sheet of sintra over the form to get the base curved shape. 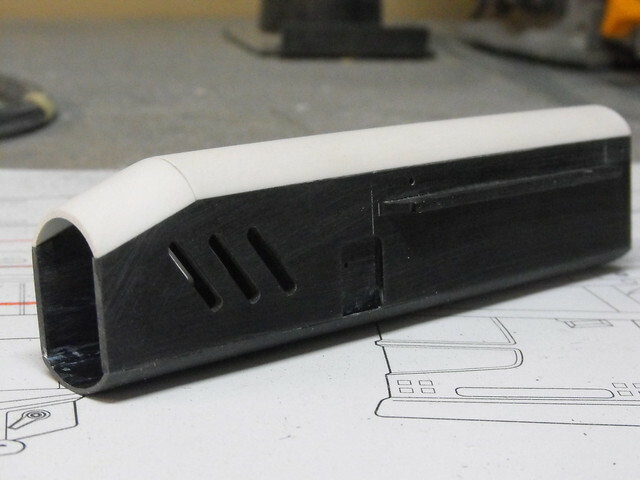 A piece of .020" styrene was then cut in the shape of the grip on a flat plane. This was then glued to the U-shaped sintra piece and sanded down to the edges. 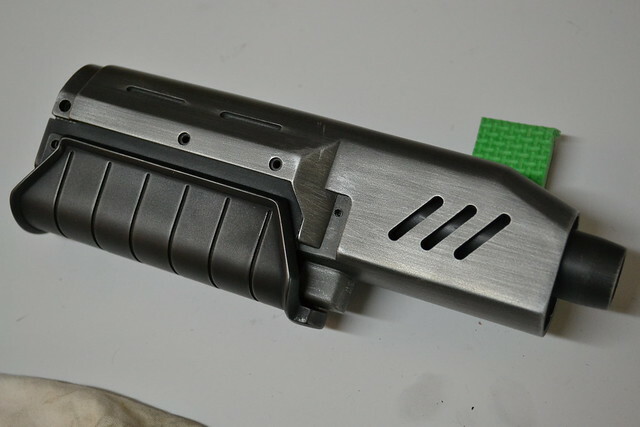 There's a sharp angled ridge that defines the outer edge of the grip. I started out by sculpting this roughly in apoxie sculpt. 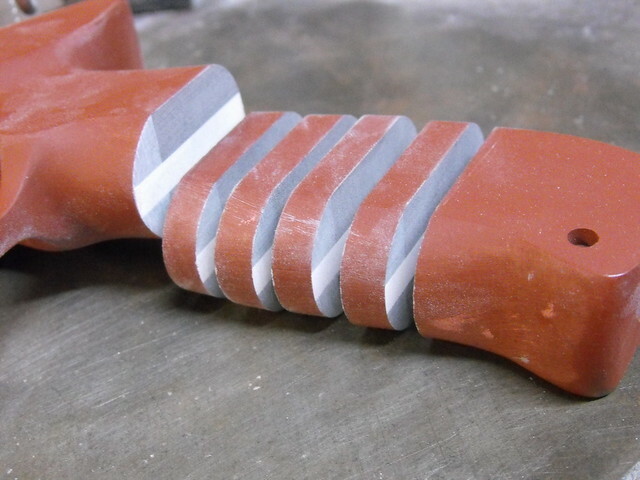 It might not look like it, but I took care to make the inner edge as even and straight as possible, since cleaning that up after the clay cured would be difficult. Here it is again after a lot of sanding and a few spots of filler. 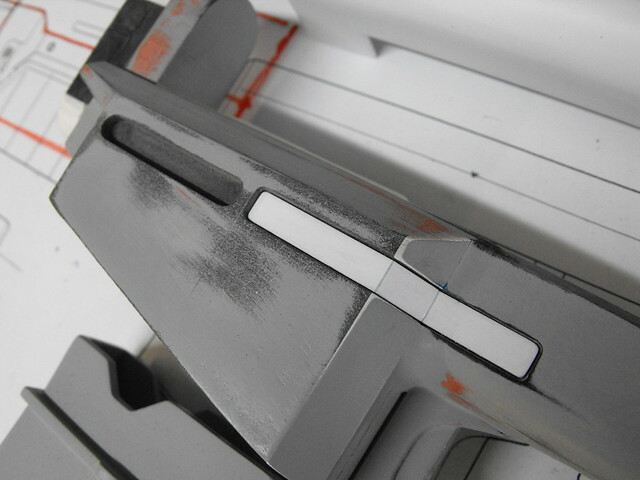 A small semicircular detail was added to the front to act as a mounting point for the grip to the rest of the gun. The bolt and shell were both turned on a lathe from blocks of urethane resin. 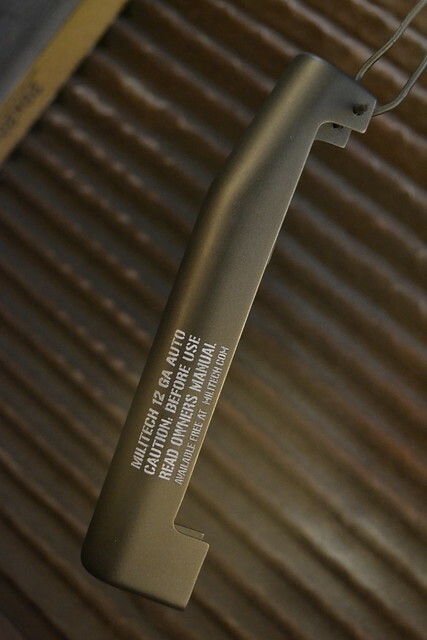 The lettering on the bolt was laser etched into the surface. Smaller bits here - the trigger is a single piece of laser cut acrylic with apoxie sculpt detailing for the wider paddle shape. The bolt lever is actually a 3/8" nut insert with a piece of stainless steel rod epoxied into place. 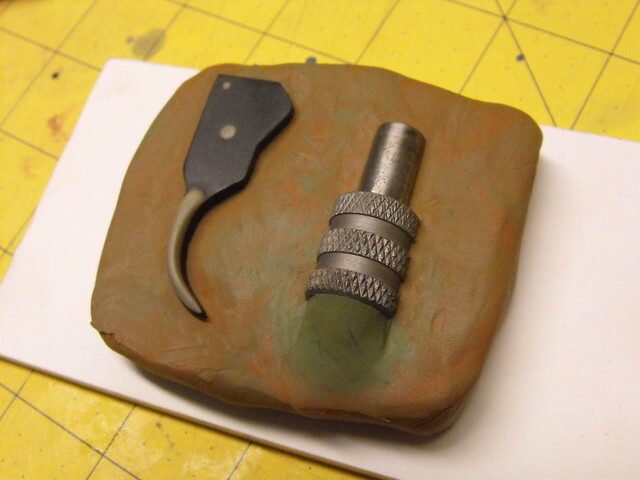 This shot shows both parts embedded in clay awaiting mold silicone. 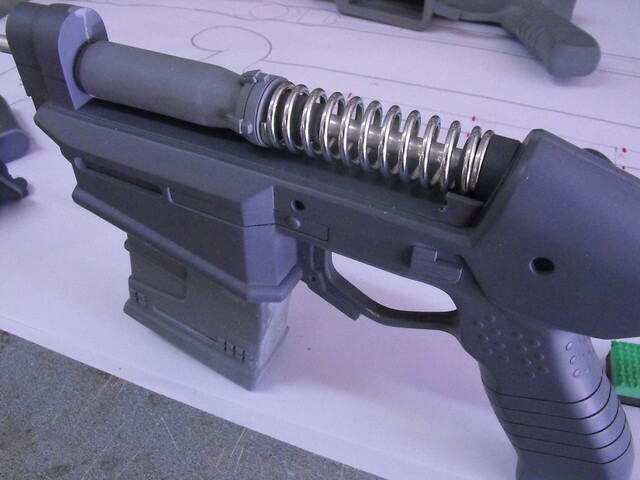 You can see the upper bolt shroud in this shot - this is just a mock up part, but the vacuum form buck I showed earlier was used to make copies in styrene and ABS. Here's the whole kit ready for mold making! 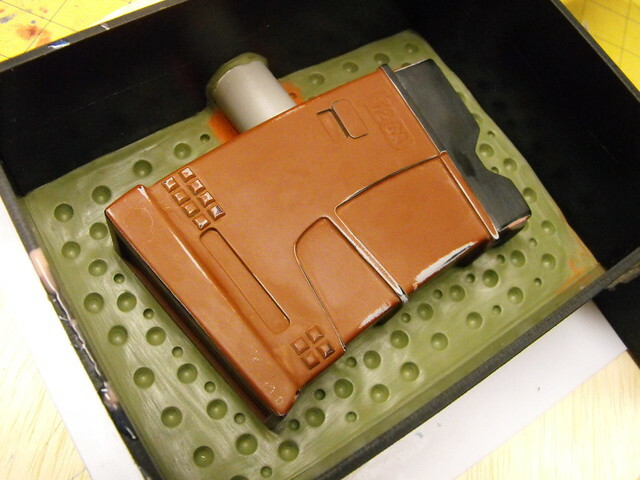 Each part was half embedded in clay and surrounded with mold walls. 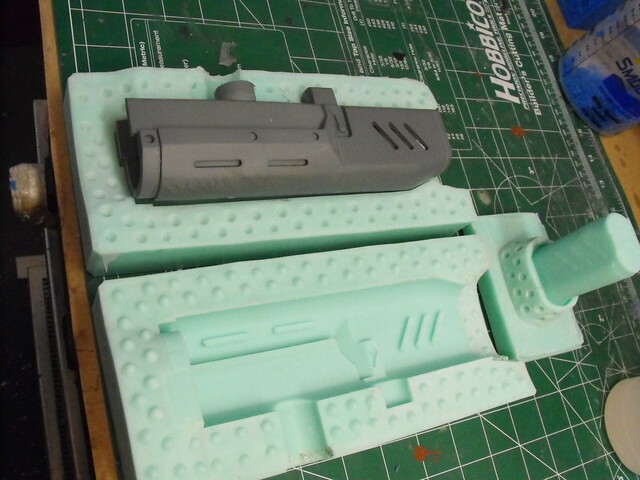 All parts were block molded, since this is the fastest process and easiest to do in a short timeframe. 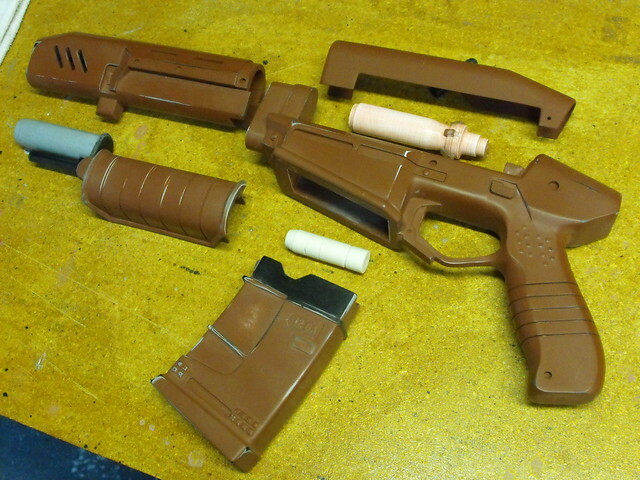 I used Smooth-On's Mold Max 40 silicone for most of the parts. 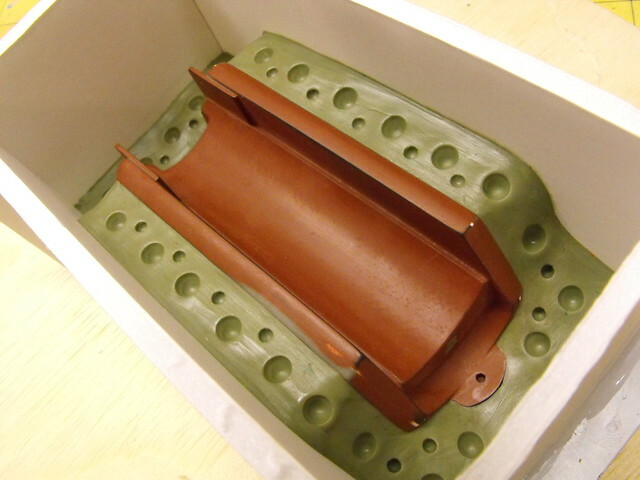 The receiver and barrel shroud each needed to have a third section added to the block molds to create the cavities for the magazine and barrel. 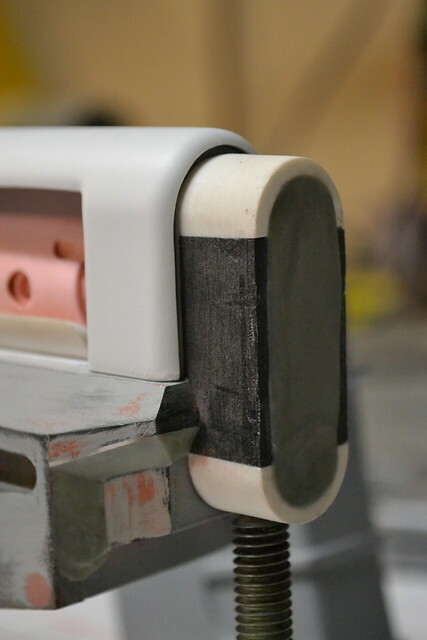 I left clay plugs around these areas and capped off the openings with styrene and masking tape in order to keep silicone from flowing into these areas and locking the parts in place. 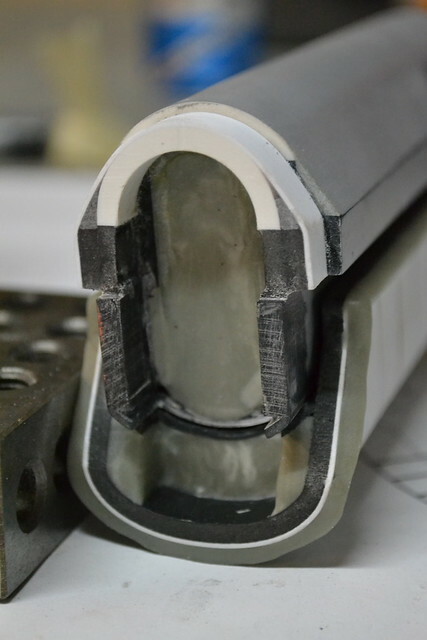 These three shots illustrate the cavity of the barrel shroud. 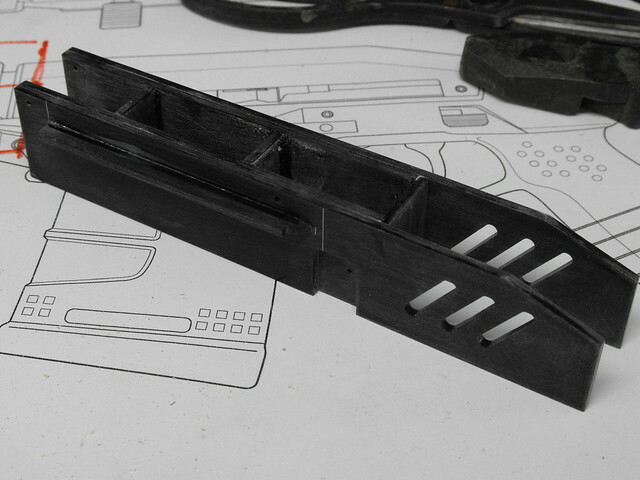 The upper thin plug ensures the forward section of the part is cast hollow. 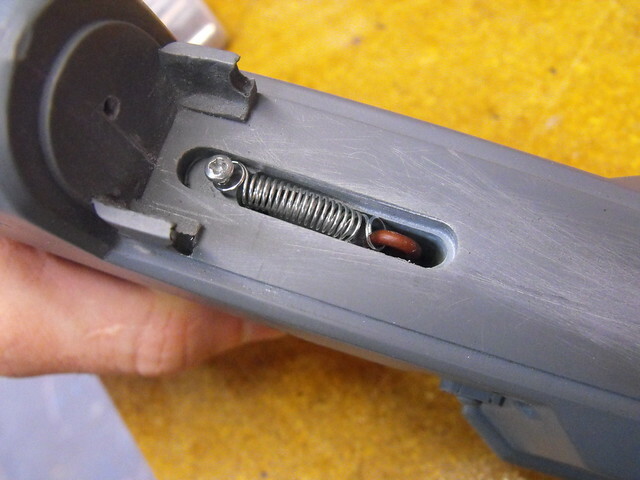 A similar plug allows the magazine well in the receiver to be cast in a similar way. 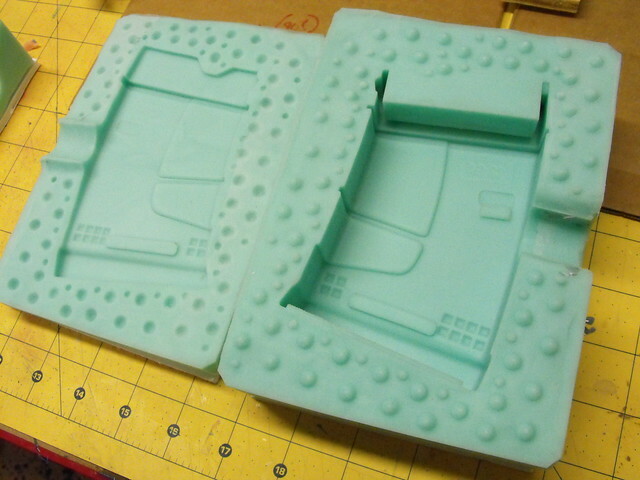 A few shots of finished molds and some cast parts. 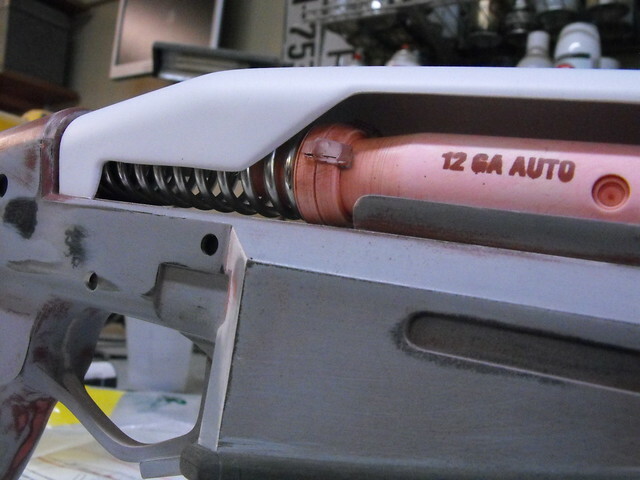 The stenciling on the side of the bolt shroud was done by laser cutting masking tape then airbrushing acrylic paint onto the stencil. I've since discovered a better material for this (stencil vinyl, duh) but the results here were still quite good! Here's a shot of the inner guts of the bolt assembly. The large spring was sourced though McMaster-Carr and an aluminum rod makes sure everything stays on center. 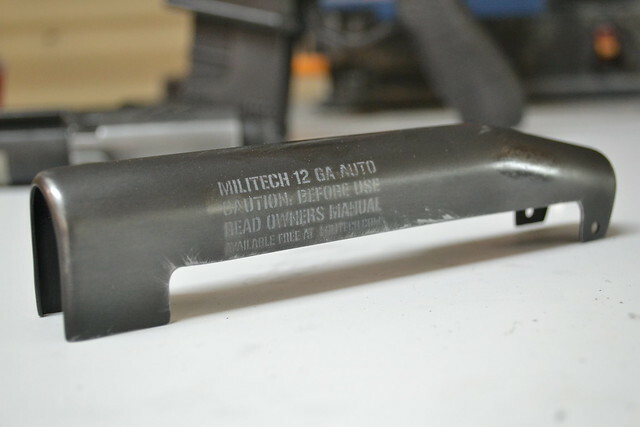 This rod also extends forward into the barrel shroud, giving the piece more rigidity. A slot was milled into the main body for the trigger, which articulates on a pivot bolt and is returned to place with a small spring. Here's all of the cast parts assembled - no glue is used, all pieces fit together with screws only! 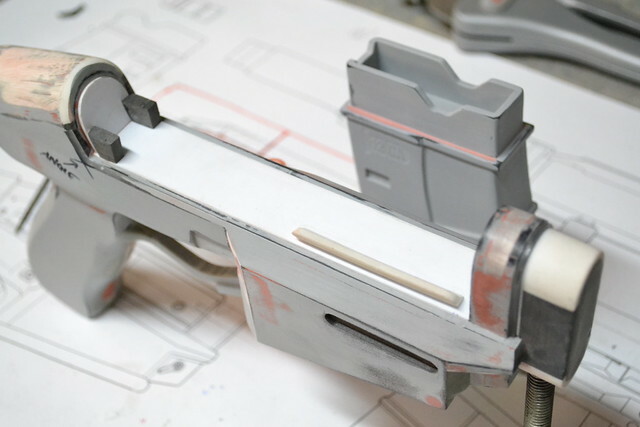 A note I got from CD Projekt RED outlined the specific materials for each part of the gun, so I took great care in deciding on paint and finishing coats. 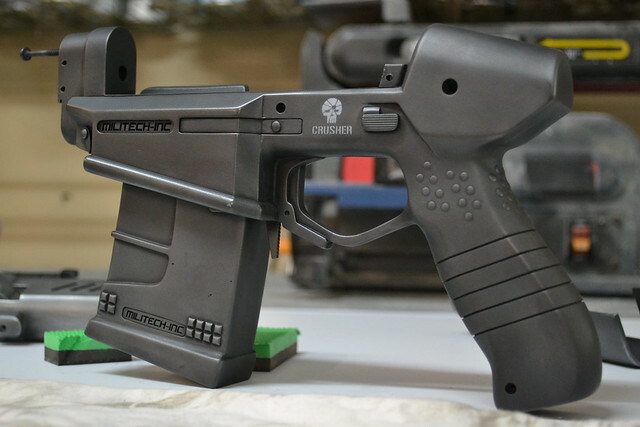 The main body, forward grip and magazine were supposed to be a black polymer plastic, so each was painted with flat black enamel. 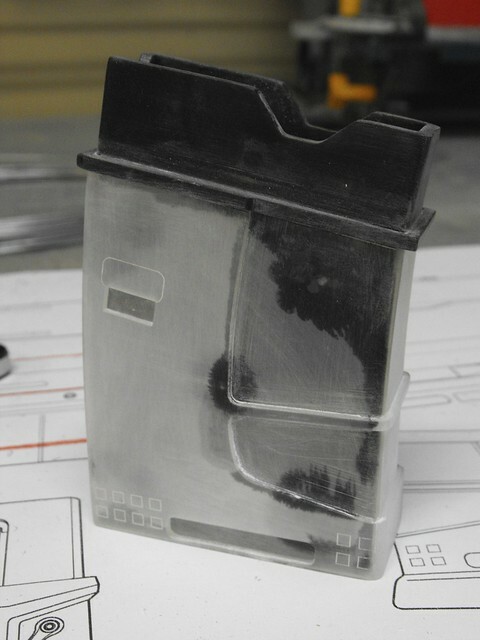 The bolt shroud needed to simulate scratched steel. 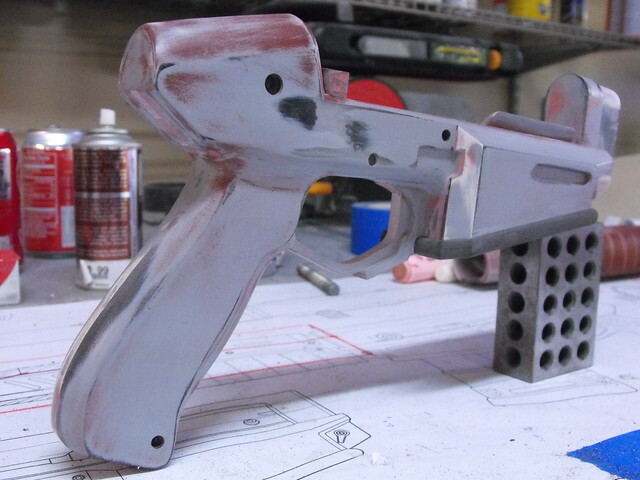 I used a base coat of Testor's "Gunmetal" Metalizer for the initial color. 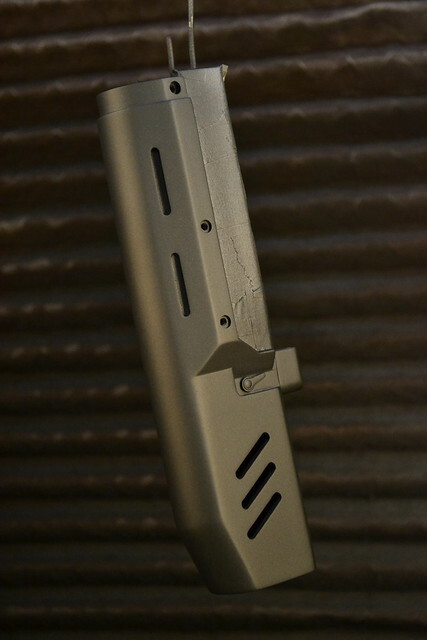 The barrel shroud was supposed to be brushed aluminum on the upper section and polymer on the lower. 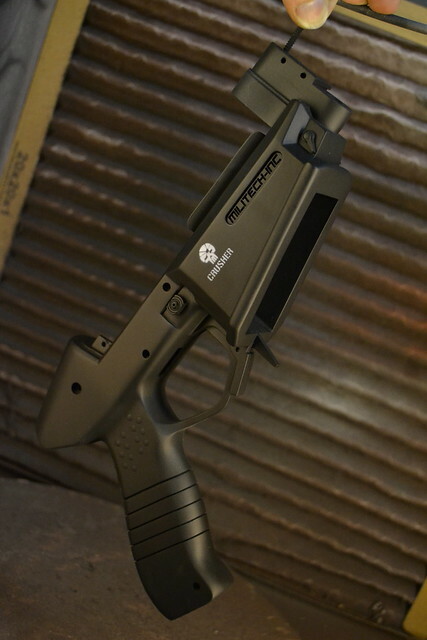 This first got a base coat of flat black, then a second coat (after masking) of bright aluminum lacquer, followed by a thin coat of gunmetal lacquer. After allowing the gunmetal coat to cure overnight, 000 steel wool was used to gently create brush marks across the surface, bringing out the coat of aluminum lacquer underneath. 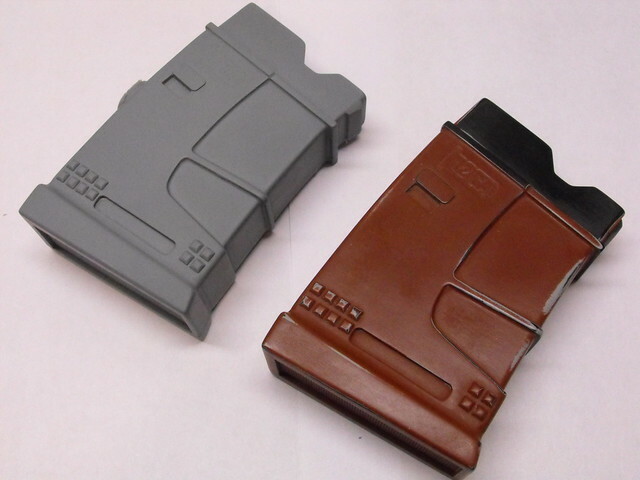 I wanted a bit more depth for the polymer parts than just flat black, and I recalled a build over at the Replica Prop Forum where a builder who goes by Matsuo used graphite to highlight areas on his gun projects. 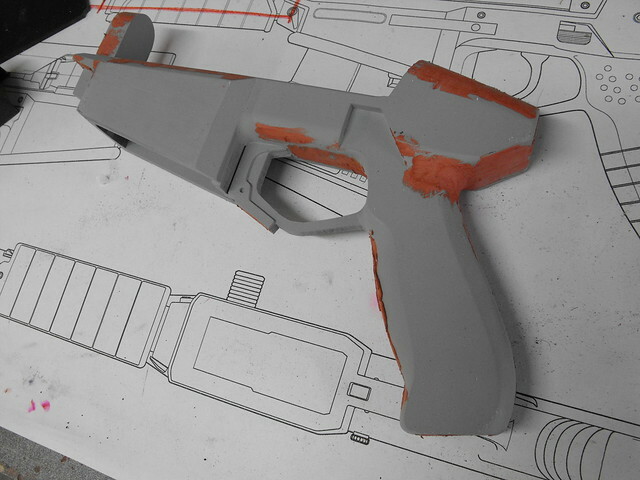 I started out just raking a pencil across some of the higher parts of the gun, which gave subtle highlights, but not quite enough. I rubbed an old piece of cotton cloth with a stick of HB graphite then wiped down the entire surface of the gun body, grip and magazine. The result was perfect - it dulls a bit with clearcoat, but I'm very pleased with the technique. 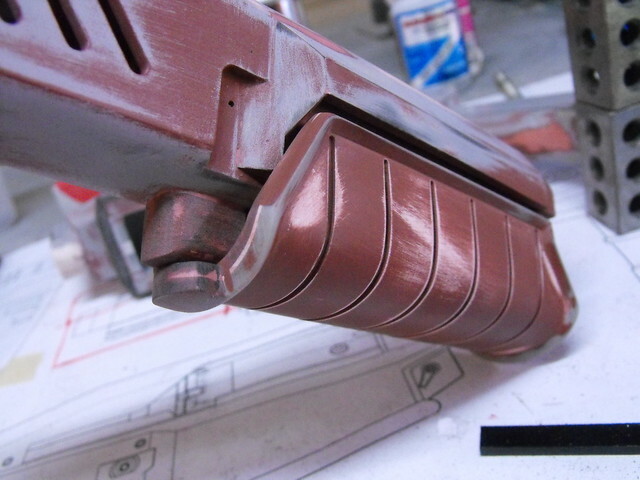 Most of the weathering on this piece was done to the upper bolt shroud, since it was supposed to be scratched steel. 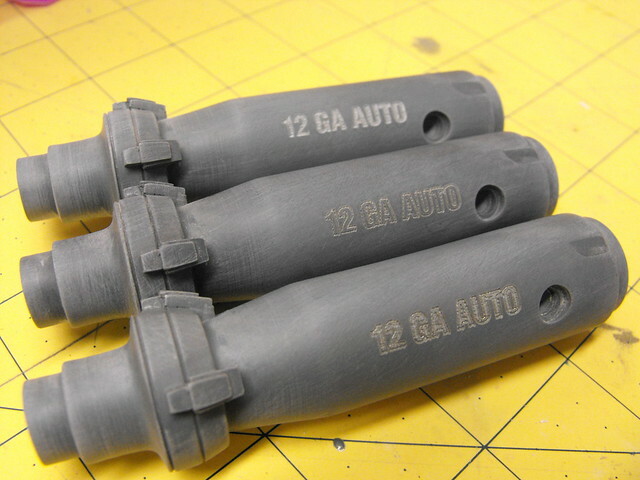 The remainder of the parts only got a very light black wash of acrylic to accent seam lines and cavities before clearcoat. My friends over at Creations n' Chrome were able to chrome plate the bolt and shells for me, matching very well to the spring and polished aluminum rod. The whole kit - screws and all - ready for assembly! 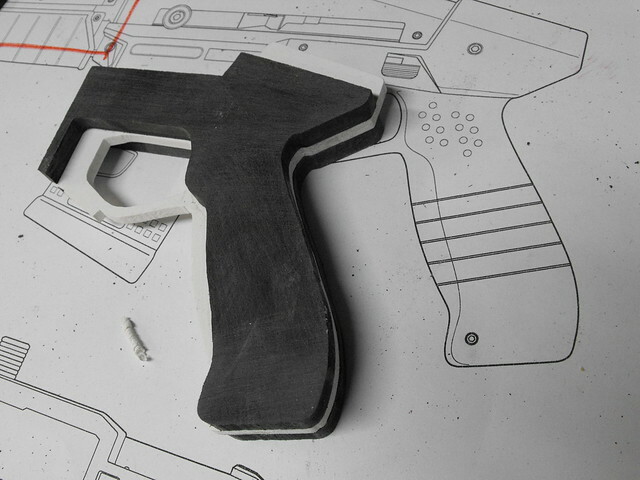 I made an acrylic display base with an inset logo for showcasing the gun. The Crusher has already been shown at E3 and will be heading to Gamescom shortly! Make sure to check out the gallery for more completed shots of the piece in higher resolution. 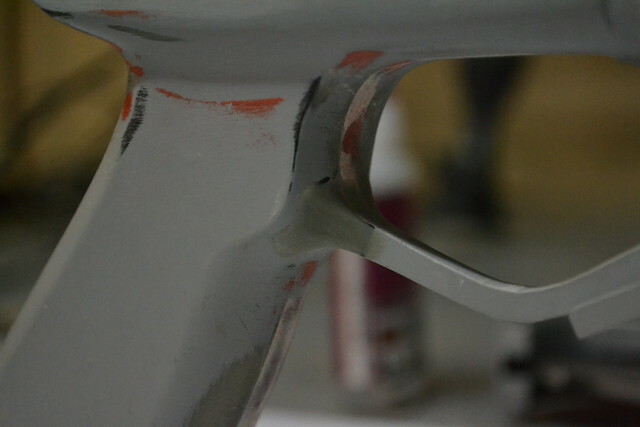 As always, there are more progress photos available on my Flickr page for those interested.